Last week, the friends, supporters, and donors of our charity attended a panel discussion on pitching and injury avoidance, hosted by Ed Randall, the Founder and CEO of Fans for the Cure. The third event in our Talking Baseball Series, the evening featuring Tommy John was an opportunity to highlight the value of early detection of prostate cancer, to raise money for our work, and to have fun talking baseball. 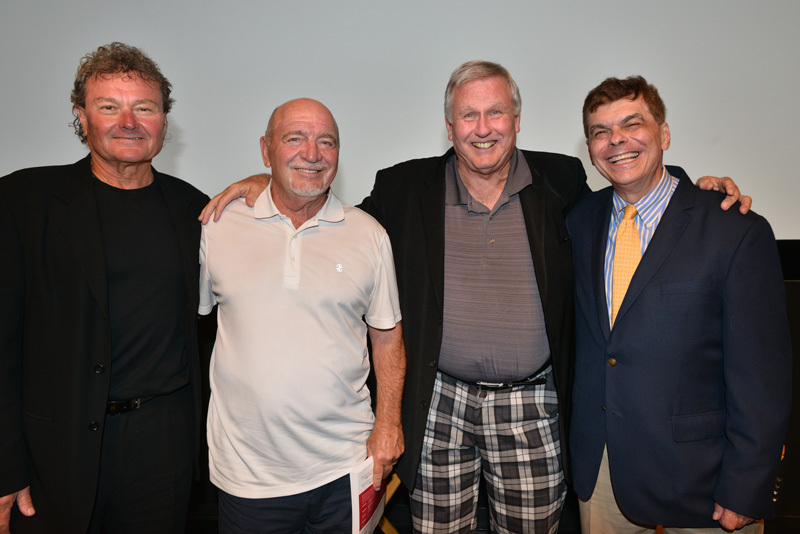 Three highly respected authorities in pitching, Tommy John, Leo Mazzone, and Rick Peterson, took to the stage at the SVA Theater in New York City to chat about their careers as pitching coaches. Mazzone and Peterson coached three Hall of Fame pitchers. Mazzone and Peterson both spoke extensively about their philosophies, agreeing that a fluid follow-through can prevent injury. Leo Mazzone was the pitching coach for the Atlanta Braves team that won 14 consecutive division titles and five National League pennants as well as the 1995 World Series. From 1991 through 1993, the Braves starting rotation made 537 starts and missed just one. Over 12 seasons, the starting rotation averaged 146 starts in the 162-game season. The rotation made all their scheduled starts in the post-season 14 straight years. Leo Mazzone said one of his tenets of pitching is “controlling the effort” and that he wishes pitch counts and velocity measurements were removed from video boards throughout baseball. Rick Peterson was a minor league pitching coach in the Chicago White Sox system in Birmingham, Alabama when he was told to visit the American Sports Medicine Institute (ASMI) laboratory, founded by Dr. James Andrews in the same city. He became the first person in uniform to do so and has become a leading advocate of Dr. Andrews’ pioneering work in the field of analysis and injury prevention. Tommy John surgery, or ulnar collateral ligament reconstruction, is a hugely prevalent medical procedure in the MLB. An astounding 87% of pitchers who appeared in a major league game during the 2017 season had undergone the procedure. At our fundraising event, Tommy John surprised the audience in disclosing that not one pitcher of the more than 1,500 pros that have undergone the surgery named in his honor has ever contacted him. In 1961, Tommy John signed with the Cleveland Indians. In 1962, his arm began hurting and he had his first cortisone shot in November 1963, the day John Kennedy was shot. The night of July 17, 1974, while pitching against the Montreal Expos in Dodger Stadium with a record of 13 wins and 3 losses, he felt a sensation in his elbow he had never felt before. He had ruptured a ligament and was to become two months later the recipient of an experimental surgery that had only been used on polio victims. Dr. Frank Jobe told Tommy John that the chances of a successful surgery and him resuming his baseball career was 5%. With nothing to lose at age 31, he underwent the surgery and, in doing so, became a historic figure as the subject of what many consider the most extraordinary medical advance in baseball history. After a year of rehabilitation, he returned to the mound in 1976 and played through age 46, retiring in 1989. He won more games after his surgery than before (164 vs. 124). When honored at the Baseball Hall of Fame with Dr. Jobe, Tommy John said the three most important figures in baseball history were Jackie Robinson, Marvin Miller, the founding director of the Major League Baseball Players Association, and Dr. Jobe. Warmly welcoming our friends, supporters, and donors, our team of volunteers was on hand again, contributing to the success of the night. We say again a great many thanks to Mike and Michelle DiBartolomeo, Cary and Perry Moorstein, Andy Starr, Jeff Spaulding, and Laura Ruiz. It’s never a bad time to support our work, so if you’d like to make a donation now in support of our work, please do so by clicking on the big button below.